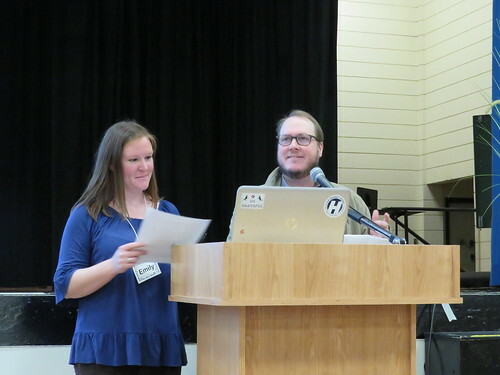 Here’s the last bit of raw video (I think) from last weekend’s Just Transition summit in Regina, SK. 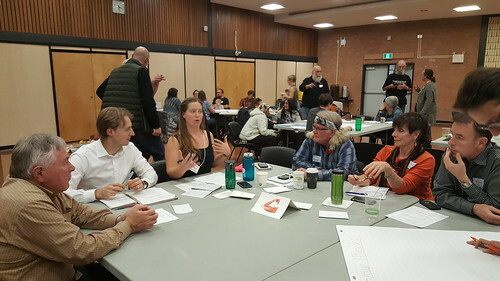 Activists and scientists gathered to share and learn about ways of fairly transitioning our province away from fossil fuels that are causing inter-generational harm. At lunch, to entertain the crowd at the Just Transitions summit in Regina, musician and song writer Laura Stewart played her carbon tax song. It’s pretty catchy, and I hope the PM listens to it. The organizers will have edited content from it online at a later time. Here are my videos and photos from the two day event. 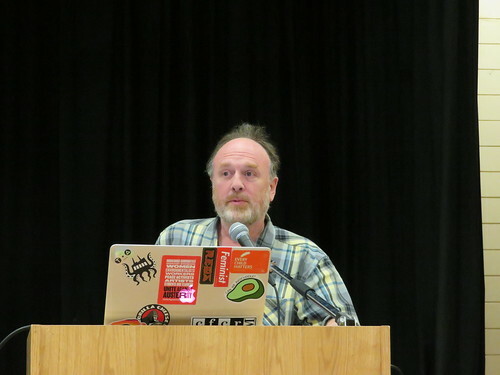 The point was to find paths to implement a just transition for workers in fossil fuel industries in Saskatchewan, and what that means in our colonial and capitalist economy. Industries in the boom/bust cycle are infamous for shutting down within a day, and throwing the local economy into chaos, so just transitions is a solution to that problem, for a more fair transition to the renewable economy that can replace fossil fuels. After listening to my comments about Design Regina and community gardens, the City Council passed the OCP. Also up for discussion was SomerSet beside the Upgrader. It touches Uplands, I think. Four Councillors voted against it due to air quality concerns; Bryce, Findura, Fraser, and one other I forget, maybe Hawkins who had questions about the caveat not yet written for the land titles to be sold. I also made a comment in the Minutes of the meeting, expressing an objection to giving a tax exemption to land owned by Suncor, one of the world’s most profitable corporations. Subsidizing parking lots leads to less money for Transit, and cheaper car ownership. The RTSC is not a school technically, as the City admits, which is why it must seek an exemption. If an exemption is not granted, there would still be the opportunity for the “school” to charge people for parking, to easily pay the tax that should be levied for the surface parking. We could think about why so many Councillors leaped to defend this exemption, instead of seeking a little extra tax money owed. Remember that next time they say things are too tight to consider a project you’re hoping the City will invest in, or when they raise your property tax next year. I have several comments for agenda items on December 16th. I do not need to appear before Council for every one of them, but wish for my questions and comments to be shown to them for the instances where I do not speak as a delegation. I ask why is this Parking Lot not being taxed? Perhaps the answer will arise during another delegation during the meeting, but if not I want my opposition to such a plan on record. If parking is subsidized, then it’s less likely drivers will feel the true cost of driving and parking, so they’ll make a less wise economic decision. An oil company, and a trades training place should be preparing workers for the reality of the free market, and the costs associated with transportation to work. Additionally, there would be less tax collected to properly fund our public transit system that can deliver these people to their place of training and eventual workplace. I suggest this amount be adjusted upward to whatever point it would take that pathways within Wascana Parks can be repaired to the standard for City paths and sidewalks. I contacted WCA about a badly cracked asphalt pathway north of the University of Regina campus, and was told that they couldn’t afford to fix that pathway. It is the only path between campus and University Park on the other side of the Ring Road. Riding a bike on that MUP is very uncomfortably jarring. First, I congratulate City Council and the City Administration for nearing the end of a years long consultative process that has produced a document that can help transform Regina into an even better place to live in harmony. I look forward to other projects as engaging as Design Regina, and hope you all appreciate the opportunity such processes provide you to work with your city’s most enthusiastic planners and policy participants. Regarding one proposed addition, I’d like to point out that flood regions that would have buildings blocked by provincial requirements, are not unusable land between floods. The flooding region beside the MultiUse Pathway north and south of Assiniboine Ave. would make ideal community garden locations. With a potential irrigation source nearby, and no building development potential, a seasonal garden used by citizens in the surrounding neighbourhoods would be something I’d be excited to see the City pursue. Enter your email address to follow new posts and receive notifications by email.